The mercury rose to 96 degrees, and the women stayed inside out of the heat. Even out of direct sunlight, however, the indoor air had to be stifling, so the women are to be admired for working with layers of fabric in their laps as they sewed. The ladies weren’t nearly as warm, however, as the men outside on the building lot, moving stones, or the men making shovels inside the factory. Everyone baked. A new servant, Catherine Middleton, arrived to help with the sewing and, as she had been for the past few days, dressmaker Julia Mahoney was present to help Evelina. The women worked on several projects, including a “brilliant” dress for young Susie Ames. Brilliant was a pretty, shiny cloth, recognizable for its glazed and, often, patterned surface. 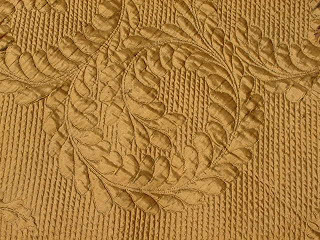 It was a fabric that had been especially popular in the 18th century, but still had its admirers in the 19th. Known by other names, including calamanco, the cloth originated in Norwich, England, a center for textiles. Its origins make us wonder if the cloth Evelina was using had been made locally, in Lowell, Mass., say, or Rhode Island, or had been imported.